How can you determine if a reaction is endothermic? The temperature of the system decreases. The temperature of the system increases. The temperature of the system remains constant. A few grams of calcium were placed in a test tube containing dilute hydrochloric acid. The temperature of the mixture rose as a reaction was seen to take place. Bonds were broken and new bonds were made. This was an exothermic reaction. Heat was absorbed by the system. Heat was released by the system because this was an endothermic reaction. Of the following statements, only three are correct about the burning of a hydrocarbon in oxygen. What is the principal component of natural gas? What are the two main constituents of bottled gas, which is used to fuel patio heaters? Study the energy profile diagram shown and select the correct type of reaction for this diagram. In an experiment, 500 ml of 0.1 M hydrochloric acid (HCl) is added to 400 ml of sodium hydroxide (NaOH) solution. How many moles of acid and base were there originally? How many moles of acid and base were used? What do m and c represent in this equation? In an experiment, a student neutralises 0.1 mole of HCl with 0.1 mole of NaOH with the release of 5.72 kJ of heat energy. In an experiment, 50 ml of HCl were neutralised by 100 ml of NaOH. The heat capacity of the mixture was 400 J/K and the temperature of the mixture rose by 7 K.
How much energy was released during this reaction? The apparatus shown was used, where HCl was reacted with NaOH. Select three precautions that would lead to a more accurate result. Repeat the experiment and get an average temperature rise. Place a cover on the container. 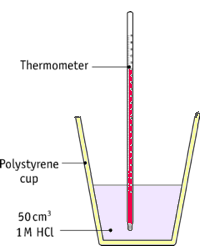 Measure the temperature in Kelvin rather than degrees Celsius. Which two of the following statements about bond energy are correct? 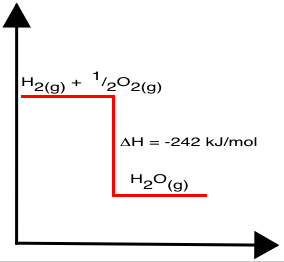 The heat change that occurs in a reaction depends only on the initial and final states of the reaction, and is independent of the path followed. In a chemical reaction, 65 kJ of energy are needed to break all of the bonds of the reactants, and 85 kJ of energy are required to form the bonds of the products. What is the heat of reaction? It requires 425 kJ/mol to break the first C-H bond in the methane (CH4) molecule, and 335 kJ/mol to break the fourth C-H bond. In performing calculations involving bond energies, what value for the C-H bond energy is used? An average value of different C-H bond energies obtained from different compounds containing the C-H bond. An average value of C-H bond energies in methane. The energy needed to break the first C-H bond in methane. The energy needed to break the fourth C-H bond in methane. Considering the following reaction, what is the heat of combustion of sulfur? 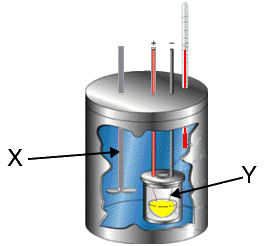 The diagram shows an apparatus used for measuring the heat of combustion of a fuel. What are the parts labelled X and Y? 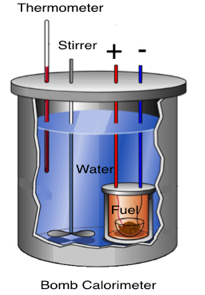 When using a bomb calorimeter, which one of the following is not necessary in order to get an accurate result? The fuel sample must have a mass of 1.0 g exactly. The water must be continuously stirred. There must be excess oxygen. The apparatus must be insulated. Propane (C3H8) has a relative molecular mass of 44, and its heat of combustion is -2222 kJ/mol. What is its kilogram calorific value? When one mole of methane is burned in excess oxygen, 890 kJ of heat energy is released. Which one of the following equations best describes this reaction? In calculating the heat of formation, the substance must be formed from its elements in their standard state. Which one of the following is not in its standard state? Which one of the following equations does not satisfy the conditions for the heat of formation? Assume that the heats of formation values are correct. What is the (heat) enthalpy change for this reaction in kJ? Which one of thr following equations represents the standard heat (enthalpy) of formation of calcium fluoride? 25 cm3 of 1.0 mol dm−3 NaOH is added to 25 cm3 of 1.0 mol dm−3 HCl. The temperature rise is 6oC. Which reactants will also give a temperature rise of 6oC? 50 cm3 of 1.0 mol dm-3 NaOH and 50 cm3 of 1.0 mol dm−3 HCl. 25 cm3 of 2.0 mol dm−3 NaOH and 25 cm3 of 2.0 mol dm−3 HCl. 50 cm3 of 0.5 mol dm−3 NaOH and 50 cm3 of 0.5 mol dm−3 HCl. 100 cm3 of 0.25 mol dm−3 NaOH and 100 cm3 of 0.25 mol dm−3 HCl. The table shows the heat of combustion of four straight chain alkanols. What is the mass of water that could be heated from 20°C to 45°C by the complete combustion of 1.0 g of heptan-1-ol? Which of the following is correct about the energy changes during bond breaking and bond formation? Which one of the following statements is correct about the reaction shown? 98 kJ of energy are released for every mole of SO2(g) reacted. 196 kJ of energy are released for every mole of SO2(g) reacted. 196 kJ of energy are absorbed for every mole of SO2(g) reacted. 98 kJ of energy are absorbed for every mole of SO2(g) reacted. Which statements are correct for all exothermic reactions? 1. The enthalpy of the products is less than the enthalpy of the reactants. 2. The sign of ΔH is always negative. 3. The reaction is rapid at room temperature. Which type of reaction is referred to in the definition of standard enthalpy/heat change of formation? What is the energy change (in kJ) when the temperature of 20 g of water increases by 10°C?